Rear view of this splendid coach taken in October 2008. And here's the outcome.... fully renovated and painted in (inauthentic but attractive) Midland Red coaching livery in September 2005. 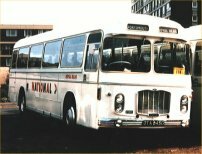 Carrying the ubiquitous National coaching livery during the 1970s.